Enjoy a trip by luxury speedboat from Phuket to Phi Phi Island, Bamboo Island, and Maiton Island. Experience a full day of fun and enjoy sightseeing, swimming, and snorkeling with an experienced crew. For pick-ups from Naiharn, Rawai and Sai Yuan, the pick-up time is between 7:00 AM and 7:15 AM. For pick-ups from Naiyang, Kamala, Karon and Kata, the pick-up time is between 7:15 AM and 7:30 AM. For pick-ups from Bangtao, Surin and Patong, the pick-up time is between 7:30 AM and 7:45 AM. For pick-ups from Phuket town and Panwa, the pick-up time is between 8:00 AM and 8:15 AM. 7.00 AM – 7.30 AM: pick-up from your hotel and transfer to the harbor. 9.00 AM: depart from the harbor for Phi Phi Islands. 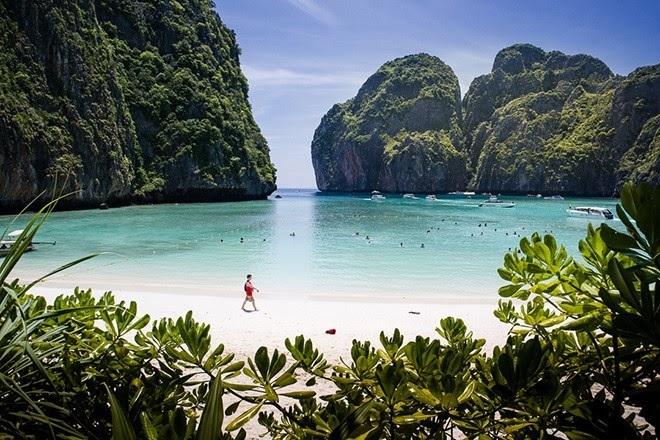 Discover Maya Bay made world famous in the movie “The Beach” starring Leonardo Dicaprio. Sunbathe on the beautiful white sand beach fringed by dramatic limestone peaks or roam jungle paths among chattering birds into Loh Samah Bay. Be awed as you slowly cruise to Pileh Cove and sightsee from the boat, otherwise known as the Emerald Lagoon. Next, explore Viking Cave, and Monkey Beach offering another highlight, and you may even have a chance for a monkey selfie. Enjoy a sea view buffet lunch served at Phi Phi Don Island. Relax at Bamboo Island where you can sunbathe again on the white sand beach or snorkel over the coral reef and spot a variety of sea life. Visit Maiton Island where you can snorkel in crystal clear water over the coral reef. Arrive at the harbor with a safe journey and transfer back to your hotel.